On the one hand, a system should run smoothly. On the other, you want to minimise the outlay for inspecting and maintaining your system. With KSB Guard, both are possible! 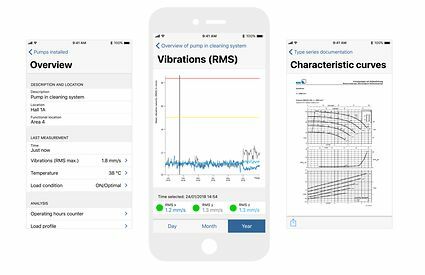 For the first time, we offer you the ability to gain an overview of the data on all of your pumps without having to be physically on site. Reliable - KSB Guard monitors the status of your pumps hourly and notifies you immediately of any deviations. This allows you to fix problems before more substantial damage occurs. Quick - KSB Guard saves resources starting with the installation, as the sensor unit is easy to install and pumps are quickly registered. Straightforward - Specific status data helps you plan maintenance intervals. You also know sooner what to expect when performing maintenance work. A busy schedule can make you pressed for time, and necessary inspections create additional stress. This is where KSB Guard comes in, by minimizing the need to be physically present on-site to check the pumps. You can check the relevant status data at any location whenever it is convenient for you. But that’s not all! Whenever maintenance is required, you can also quickly and conveniently access all your pump data. bearing needs to be re-lubricated or replaced. KSB Guard allows you to plan for maintenance jobs based on specific measurement data. This, in turn, allows you to use your resources where they really are required. Documenting and tracking work on a pump takes just a few clicks, thereby preparing the ground for the next maintenance routine. route any additional cables or wires. All measurement data is transferred at the touch of a button. 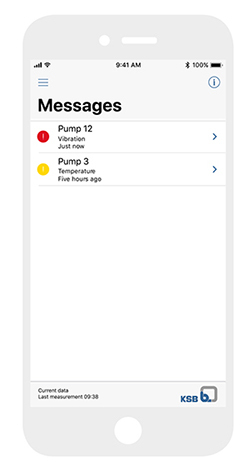 New pumps are then simply added using the app or computer. You can change the settings directly online, such as the threshold from which you want to receive warnings.